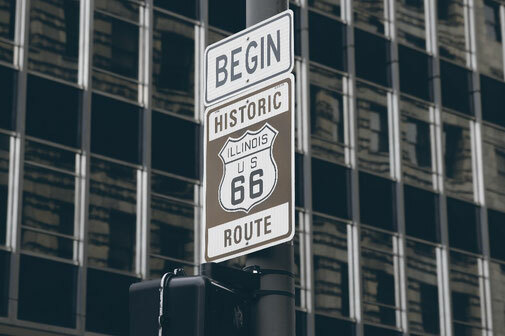 Route 66 does not exist – 5 funny and interesting facts about a legendary road. Pale green cacti are growing into the blue sky. Red rocks are flooding the soft shoulder of the road. A vintage car is stopping in front of an old gas station from 1920. That must be Route 66! I’m throwing my travel guide on the co-driver’s seat staring at a plain field of endless corn. My rental car is rumbling through a bad pothole and a huge sign is screaming WALMART at me. Route 66 is a legend and people tend to glorify it. If you’re looking for pictures about the road on Google you’ll find red sunsets behind a horizon with a never ending street. But here we go with five myths about Route 66 (some people might call them alternative facts) which are not true. I bet you’ll be surprised! Wrong. 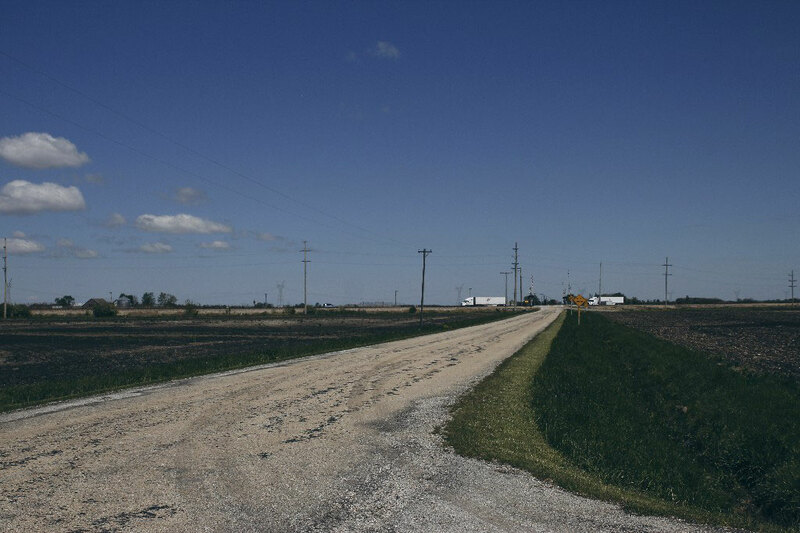 There is no end-to-end Highway 66 anymore. This was possibly the most shattering fact I discovered by doing the research for my huge road trip. Somehow I thought I’ll follow down Route 66 from Chicago to LA like the German Autobahn 1. From the beginning to the end. But even the history of Route 66 is a picture made out of snippets. There was no machine tarring a road from east to west. In fact the government realized that there was a massive boom going on in the automotive industry of the US in the 20s. So there was the need of an end-to-end Highway between Chicago and the Pacific. All they did then was connecting roads from different villages along the path that already existed. This was what they called “US-Highway 66”. But what happened next? Only 30 years later the narrow and worn-out roads were unable to cope with the traffic anymore. At first the government tried to build detours and shortcuts. That’s the reason why you’ll find alternative alignments on your way. 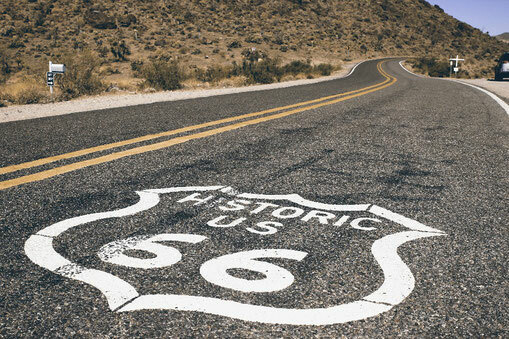 There you’ll have the chance to follow different routes of Route 66 in different decades. To me it was very interesting and I merely chose the oldest ones. A little later President Eisenhower started to like the idea of the German Autobahn a lot. He gave an order to build multilane Interstates next to Route 66. What sounded like a great idea cut shops and people off. Simply off. Many lost their livelihood and it was a tragedy. In 1985 the name “US-Highway 66” was erased from the maps. Route 66 was history. Today it’s only alive again in a metaphorically way. Some associations preserve the historic route for nostalgic and touristy reasons for adventurers and bikers. Officially there is no east-west-road called 66 anymore. In some States who don’t care a lot it’s really hard to find signs. 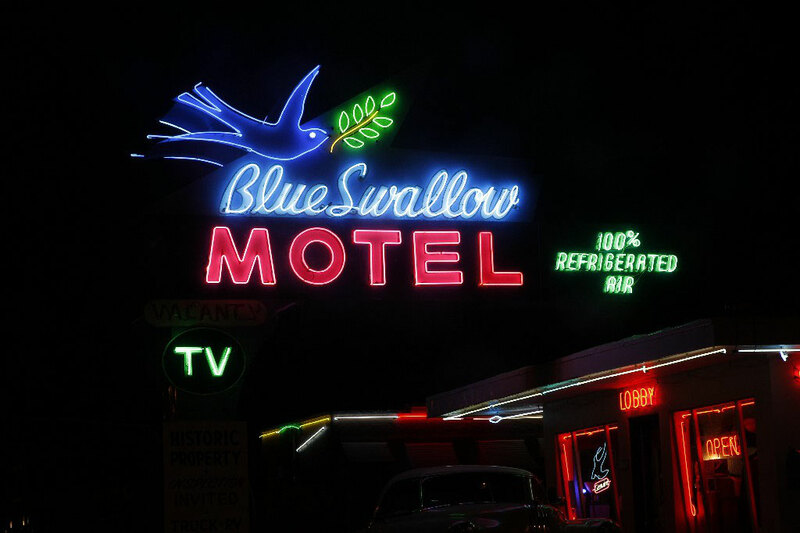 I was on Route 66 for more than 1,000 miles and already made a lot of experiences – but the broken window in my motel room on the first floor still was unsettling for a second. Outside a cigarette was glowing next to a truck. Then I calmed myself down. It might sound weird but even at that moment I did not really feel myself in danger. I never did on Route 66. At least anything can happen to you everywhere. But most of the motel keepers were friendly (or just indifferent) and all the other travelers on the road were awesome, helpful and interesting. Even when I went out in the dark to photograph famous neon signs several times there never was something to worry about. No chainsaw massacre and no truck with flashing lights. Don’t let stupid road movies buffalo you. 3. Route 66 is legendary! Surprising – but she was not the only one. In the US Route 66 is something mainly older people know. And even they are laughing about the freakiness of Europeans and their dream of driving Route 66. They don’t really understand why we’re fascinated by an old and damaged country road that sometimes even turns into a dirt road. Why don’t we simply use the smooth Interstate to get to LA? So maybe for Europeans Route 66 is legendary. But not for many Americans. I’m typing something into my offline map. Then I look around. Looking for a road sign. It has to be here. An American couple with tons of bags is almost bumping into me while I’m trying to find out where I am. South Michigan Avenue. The traffic is rumbling. This can’t be the begin of Route 66. Where is the golden sign, the poster, the archway? 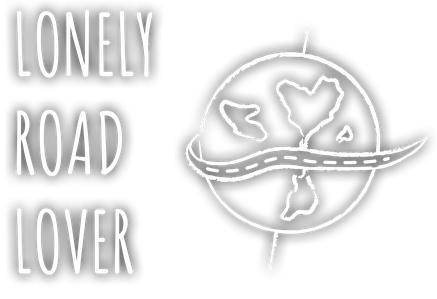 For all those travelers who are going west about more than 2,000 miles? Finally I’m spotting a small brown sign high above on a lamp pole. “Route 66 BEGIN”. Nothing else. But what could you expect from a country where some people have never heard about Route 66? Even the sign of Dunkin Donuts is more eye-catching. Quick tip: The sign of Route 66 is on the crossroad between South Michigan Avenue and East Adams Street at 41,879603 North and 87.624618 West. Back to the corn fields. You can’t deny that Route 66 is a scenic road on large parts in New Mexico and Arizona. You’ll cross red rocks, deserts and endless wideness. Some parts are even marked as “National Scenic Byway”. But there are also large parts – most of them in Illinois, Missouri and Oklahoma – that lead through plain fields, grass and monotony. To be honest they’re as exciting as Brandenburg. Even in California there are miles and miles with dry desert that are quite good at killing your good mood. So don’t be disappointed if you won’t find cacti and canyons everywhere. Especially in Illinois and Missouri the associations that take care of the preservation of Historic Route 66 are amazing. 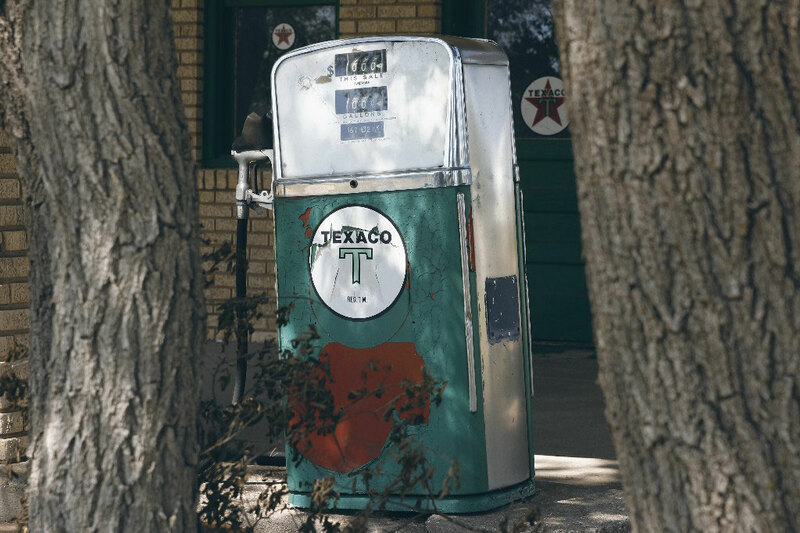 They did restore old diners and gas stations with love and bring back the golden age between 1920 and 1950. So it’s easier to deal with the corn. Do you have any questions about planning your trip on Route 66? Send me an E-Mail or message me on Facebook or Instagram and I’ll try to help you with encouragement and tips for an unforgettable road trip on an absolutely legendary road!